I one-clicked this one, price be damned, due to the HUGE love for it by many of my fellow readers, some of my favorite authors, and still… the buzz is getting louder. Maryse: BREAKING NEWS UPDATE!! I one-clicked it. I don’t even care that it’s not on sale. I HAVE to read this ➜ All the Ugly and Wonderful Things. And I’ve started. And I AM SO IN. Misty: It’s worth the money! Paula: It’s amazing. I hope you will love it as much as I did. It’s an epic story. Lisa: The best book of 2016!!! Jessica: It was an amazing book. Jen: I really enjoyed this book! Amanda: One of my top reads of 2016. Happy Reading! Erin: I just started this today as well! Andrea: I am on page 42 and loving it. Lisa: Man! Now I’m gonna have to buy it! I was trying to wait for a sale but I’m in a reading slump! Amy: HOLY MOLY!!! All the Ugly and Wonderful Things…MINE!! I apologize to all the other books in my TBR who just got bumped over but I’ve wanted to read ATUAWT since I first heard about it. I’m so giddy!! Lisa: This might have to be a buddy read! Starting now! Michelle: I finished it last night. I really enjoyed it! Very different. Did I like it? Hmm… yes. For the most part. For the “interesting storytelling” aspect of it. It was compelling, for sure. Although I COULD put it down, and had to. Often. I appreciated it, for it’s constantly thought provoking yet shocking theme (and the repercussions that I knew would follow). It had a main theme, mind you, but it was mostly shocking from all angles, and for various reasons. But I was INTO it, right to the very end (at least the full story and where this could possibly go), yet did I love it? No. That said, it’s eloquently written, and I get why there’s a frenzy. The journey is long and detailed my friends, and there are many aspects that will appall and infuriate you, so you’re in for a bumpy, albeit addictive ride. This story WILL provoke you. “Going in blind” book lovers… STOP READING HERE. I went in fairly blind (I say fairly, ’cause I HAD read the blurb and knew it was going to be a potential love story about a girl becoming friends with one of her drug dealing father’s “lackeys”) so I was excited for the “bad-bad/bad guy” unconventional love journey I was about to embark upon, but I had NO idea what, exactly, I was in for. Yikes. It’s forbidden love, and the entire story, while powerful, is constantly tumultuous and incredibly uncomfortable. Though it starts, and for a good portion, remains incredibly sweet and undeniably needed. Relieving considering the horrible life these children are living. I’m going to keep this short and sweet. It’s told mostly from “Wavy’s” perspective (starting with her perspective on life as a young child of 5 years old, and continuing throughout her young childhood, teens and into her “new adult” life). “Wavy” and her baby brother Donal are living in a dilapidated, abusive household with drug addicted parents, and a mother that is possibly manic depressive (bi-polar? ), her moods fluctuating from occasionally concerned to mostly… selfish, abusive and hateful. Scary Mama dragged me out of the closet and spanked me until the brush left bloody spots on my legs, but I stopped her from putting Listerine in Donal’s mouth. After that, I took care of Donal. I fed him and bathed him, because Scary Mama, she would give baths so hot it made your skin bubble. The Program’s book also said, BE COMPLIANT ON YOUR MEDS, but Mama wasn’t. She lives only for the love of her life, her husband (and the father of her children). And her stormy moods are dependent on his attentions. Then he left, and Mama took off her pretty dress and lay in bed all day. Sad Mama didn’t care when Donal cried, and he cried a lot. “I’m so alone,” she said. Donal and I didn’t count. He makes meth in a makeshift lab in their trailer park, and has a multitude of girlfriends along with his wife, that he abuses or loves, depending on his whims. King pin of his world, his lackeys and women, and even his brother support him, no matter the monster he is. The children are neglected and while occasionally aided by their grandmother and their aunt and uncle, they are mostly left to fend for themselves, turning Wavy into a sullen, severely introverted and often defiant child. She just wants to be left alone. Refusing to be touched, refusing to speak, and even refusing to eat, those that are trying to care for the siblings, struggle and are often pushed to their wits end. But there is ONE person that Wavy does connect with (albeit slowly) and that is one of the more “sweet-natured” friends of her father (“Kellan”). And when she’s forced to come to his rescue after he crashes his motorcycle, the bond is forged, and she finally comes to trust someone in her life. Gravel spit out of the wheels and then the motorcycle skidded and fell. The Giant tumbled off and the bike slid into the meadow, still rumbling, its tires spinning. When I got to him, the Giant was lying in the road with his arms and legs spread out. I don’t know why I wasn’t afraid. Big hearted (but very “enforcer-like” when he has to be), and also having been abused as a child, he cares for her wellbeing. He had one hand pressed to the center of Liam’s chest to push him back into his chair. That was all he needed to stop Liam, who looked small under Kellen’s hand. “Don’t do that,” Kellen said. As soon as he let go, Liam sat up. All his smallness drained out and anger rushed in again. “Are you telling me how to discipline my own kid in my house?” Liam said, but his shirt was still rumpled from Kellen’s hand. He unwittingly becomes their protector. The Giant had stopped a train, calmed a wild beast, and didn’t even spill his beer. Told from multiple POVs (surprisingly, I was fine with that, for the most part because it allowed me to get different view points, and “real life” perceptions from all angles) that vividly portrayed the “era”, the lifestyle, and the consequences depending on the relativity. It was needed, because neither of the main characters are your… “usual”. Both came from devastating childhoods and lived a socially unaccepted lifestyle due to environmental circumstance. This is all they knew, and this seemed to be as far as they were going to get assistance with, in that generation. I shoulda taken my own advice, and got the hell outta Powell. Except for Wavy. She kept me there. More than that. She kept me tethered, not just to Powell, but to being alive. In the whole world, she was the only person who cared whether I lived or died. Did I even like the two main characters? Not much, no (for various reasons… you’ll see why). Sometimes I loved them, too (for various reasons… you’ll see why). It was hard. Did I like the supporting cast of characters? For various reasons, yes. I almost liked some of them better. Some of you might even be surprised at the ones I did like. After all, while I do love (or can appreciate) unconventional lifestyles and/or love stories, I do have my limits. 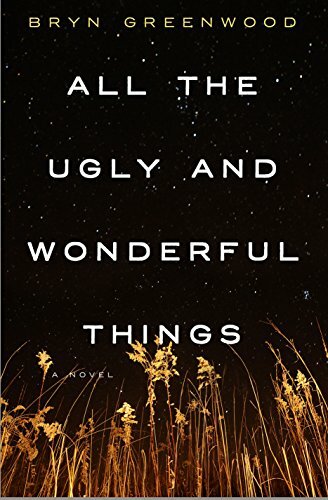 Amy: I finished All the Ugly and Wonderful Things and…hmmm…I don’t know what to say about it yet. I need to digest it a bit. It had potential with the whole forbiddenny aspect but something about it was just…off. *shrug* Not bad or anything, just off. Multiple POV thing, maybe? I dunno… Maryse…did you stick with ATUAWT? What do/did you think of it? Maryse: I’m at 90% Amy… I don’t love it like everyone seems to. I LIKE it due to the fact that it’s an absorbing story and I keep picking it right back up to continue reading, but there’s an incredible ICK-factor for me that I just… I wasn’t… I can’t… ya know? Maybe the ending will flip me around? I’m not in love. Lisa: I finished it. I need to gather my thoughts and emotions. Sarah: I love books that have the seventies setting like Nine Minutes (Beth Flynn). Awesome story, very well done! Michelle: Seriously! I couldn’t go on but I ABSOLUTELY could NOT stop! Loved it! It’s eloquently written, and I get what the frenzy was for. The journey is long and detailed my friends, and there are many aspects that will appall and infuriate you, so you’re in for a bumpy, albeit addictive ride. 3.5 stars <— MY PERSONAL score due to my own experience of it. It’s all just so disturbing. I mean all of it. Would I recommend it? Only to those that I know can handle a read that will shake them up, shock and incense them, and that they may come out of it hating it, but still appreciating the experience as a whole. This story WILL provoke you. Which brings me to my “other” score: 4.5 stars for the obvious “interesting unconventional shocking reading” aspect of it. If you’re looking for a story that will get you out of a same-ol’ storyline funk, this one will do it. P.S. MY SCORE doesn’t mean it doesn’t have an HEA. Or that it does. I guess it depends on the reader and who or what, exactly, they were rooting for. I love love loved this one, from the writing to the romance. And most of all, loved Wavy. The whole thing really spoke to me. This isn’t romance though, right? Thought it was litfic. I’m curious about it, but also hesitant. Not about the ending if litfic but the subject. Hmm. Maybe if I see it in the library. bev it’s not romance but it IS a love story. If that helps any. The entire focus (other than the social and upbringing issues) is a BIG love. I’m so glad so many of us experienced it similarly. I wish the publishers and book stores would create a category called: love stories. Or maybe unconventional love story? THAT would be a perfect name for that genre. I finished reading this book a few days ago and I’m still scratching my head! Well, the rest of my post got cut off! Anyways, it was a super forbidden fruit deal for me. But I read the book like a trainwreck…I couldn’t stop if I wanted to. I’m glad it ended like it did, even though so many lines were crossed and then crossed again! Yes I thought the writing was good but the story itself did have some ick…and the desription of his looks didn’t help:). I tried to think of them more as Kit and Grizz!! This one sounds likr it should go straight in to my Pandoras Box file on kindle!! Yikes. Well I am glad that I wasn’t the only one to have mixed emotions about this book and I am only halfway. I was beginning to think something was wrong with me! I’m reading another book right now but am sure I will pick it back up and finish at some time. Thanks for the honest review Maryse. Julie o – just checking on how’re you’re doing with the read. Huh. That was…interesting. Enlightening even. oh I know it. I MISSED that part in the book for some reason, but read it in the author’s blog post and I was all… AH. Oh.